One of the main objectives of bodybuilding training is to increase intensity progressively. The longer and harder you push, the bigger and better your skeletal muscles become. - Increase the number of repetitions performed in an exercise with a particular poundage. - Increase the weight used for a particular exercise while performing a set number of reps.
- Perform a consistent number of sets and reps with a particular poundage, but reduce the total amount of time required to complete them. 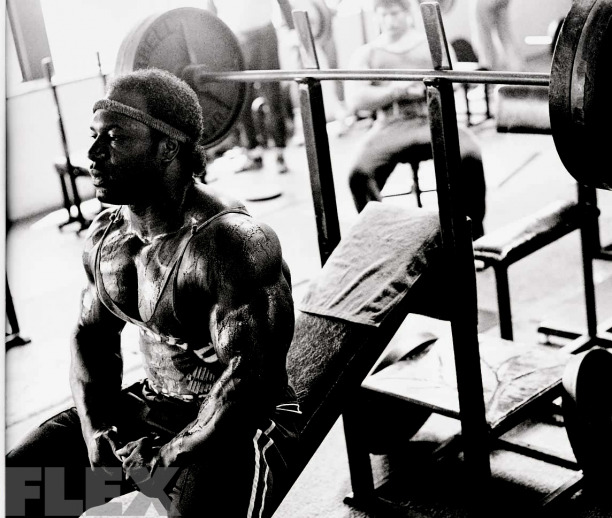 Mainly, bodybuilders combine these first two methods to increase training intensity. This is particularly true at the beginning and intermediate levels of training, as well as during the off-season/building. To illustrate, let's say you're performing sets of 8 - 12 reps of standing barbell curls. You might grind out eight reps the first time you try a particular weight. Gradually add repetitions, until you accomplish a set of 12. At that point, increase the weight by five pounds, drop back to 8 reps and again work upward toward 12. It's a systematic -- albeit somewhat boring -- means of improving training intensity. Up to a certain level, you can also gradually increase the total number of sets you perform for each muscle complex. This involves adding a new set every three to five weeks, until you are doing 12 to 15 total sets for a large muscle group and perhaps 8 to 10 for smaller body parts. The fourth method -- reducing the total amount of time required to complete a particular workout -- is a technique most bodybuilders use during a peaking cycle, and it's commonly referred to as quality training. This consists of gradually decreasing the length of rest intervals between sets, from perhaps 90 seconds down to about 45 seconds at peak pre-contest intensity. Many of the champs -- myself included -- quality train by using compound sets. These include supersets, trisets, and various combinations of giant sets. In supersets, you perform two movements (either for a single muscle group, or for two antagonistic body parts) in succession, with minimum rest between exercises. The superset is followed by a normal rest interval of 60 to 90 seconds, then another superset. Let's say you have been taking 60-second breaks between sets of arm work and that you can move between the two exercises of a superset in 5 seconds. Doing a superset and then resting 60 seconds before the second superset markedly decreases the average rest interval between sets. Instead of resting an average of 60 seconds between straight sets, you are resting an average of only 32.5 seconds 60 plus 5 divided by 2) between each of the sets of your workout. In effect, you're training faster and harder. Biceps and Triceps = barbell curls + pulley pushdowns. Quads and Hamstrings = leg extensions + leg curls. Chest and Back = bench presses + barbell rows. Delts and Back = presses behind neck + pulldowns. The best way to start out with supersets is to compound exercises for antagonistic muscle groups, preferably for smaller body areas such as biceps and triceps. After working with arm supersets for a few months, you'll be in sufficiently good condition to move up to supersets for larger muscle groups. The key here is to progress gradually from one intensity level to the next. Chest = bench presses and flat-bench flyes. Lats = chins and cross-bench pullovers. Delts = behind the neck presses and dumbbell side laterals. Quads = leg presses and leg extensions. Hamstrings = leg curls and stiff-leg deadlifts. Calves = standing calf raises and seated calf raises. Biceps = barbell preacher curls and standing barbell curls. Triceps = lying triceps extensions and close-grip bench presses. Chest (upper) = incline flyes and incline presses. Chest (lower) = decline flyes and decline presses. Chest ( in general) = flat-bench flyes and bench presses. Deltoids (variation A) = upright rows and front presses. Deltoids (variation B) = dumbbell side laterals and behind the neck presses. Lats (variation A) = stiff-arm pulldowns and front pulldowns. Lats (variation B) = cross-bench pullovers and behind the neck chins. Quadriceps (variation A) = leg extensions and leg presses. Quadriceps (variation B) = sissy squats and hack squats. If you have not been making gains from your workouts -- or you have a particularly stubborn bodypart -- try five or six pre-exhaustion supersets for each large muscle group. Supersets and other more intense compound sets aren't for everyone, however. Some bodybuilders discover that they lose concentration when compounding sets. On the first exercise they're totally keyed in mentally, but for each succeeding movement they have poor focus on the working muscles. If you determine that you have a similar problem, you will probably make your best progress sticking to straight sets. If supersets do the trick for you, you might also experiment with trisets -- compounds of three exercises for a particular muscle group, followed by a normal rest interval. Trisets are a lot tougher and more enervating than supersets, however, and they have to be approached with additional caution. I'd suggest beginning with a single triset for an especially weak muscle complex, monitoring your recovery ability between workouts, then gradually adding another triset approximately every two or three weeks until you're up to a full trisetted bodypart program. The final type of compound is a giant set, or grouping of four to six movements with minimal rest between exercises and a more or less normal rest interval between giant sets. They're murder if you haven't worked up to the level required to make gains from such a highly intense method. I don't do giant sets -- but I know many bodybuilders who swear by them. As you might expect, four-exercise giant sets are a bit less intense than five-movement cycles, and five-exercise giant sets are not as intense as the six-movement varieties. Within each of these three levels, ones for antagonistic muscle groups are significantly less intense than giant sets for a single, very complex body part. In actual practice, you'll find it downright impossible to take a normal rest interval of one to two minutes between giant sets. You'll find your rest interval creeping up to around three minutes. But even at that, you are substantially reducing the average rest between sets in your workout, and that creates the kind of intensity that builds the body you desire. Compound sets -- supersets, trisets, and various giant sets -- will be one of the most challenging training principles you'll encounter. Spend some time working up slowly in intensity and duration of your workouts while using compound sets, however, and you'll get great results.